The experience of tea with Paul Rosenberg of Heaven's Tea in one word: lifted. 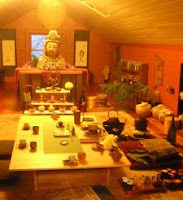 In his private tea drinking retreat in the top floor of a SE Hawthorne area home, Paul’s tea sessions beckon the visitor into divine realms. Stepping into the intimate space is like stepping into a Taoist sanctuary: antique Himalayan statues and paintings exude a meditative calmness; cakes of tea and handmade pottery with mysterious labels line dark shelves. Guests/students sit on cushions, sipping rare teas such as rich dark Chinese aged puerhs and fragrantly floral green oolongs from Taiwan, while Paul shares his deep knowledge about the tea plant (camellia sinensis), its healing properties and the range of effects that teas can have on the mind and body. The art of tea in the West is rarely carried out as professionally and serenely as by Paul of Heaven's Teas. 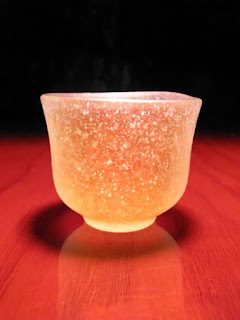 Heaven's Teas is Portland's very own School of Tea Arts. In addition to tasting sessions (such as tea and chocolate pairings), Heaven's Teas offers tea class sessions with a variety of themes, such as Tea and Ecstatic poetry or Understanding Tea and Chi. In the summer months classes are held in an outdoor tea pavilion. For renewal and inspiration, as well as a rare glimpse into a private collection of Himalayan art, Heaven's Tea is the place to spend an evening. 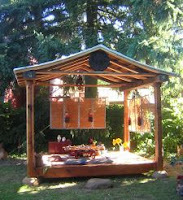 Visit Heaven's Tea website for the current class schedule or to reserve a private tea session. Photos courtesy of Heaven's Teas. Bottom photo (c)2010 Terry Asker.